8. Mini tripod stand. Can be fold away. Important Notice: This tripod stand is not a professional tripod. Please shorten the height to increase the stability. For example, only extends 1 section or 2 sections. Please test the stability before use. Please note that the cell phone and other accessories are not included. Built-in 270 degree rotatable device holder with a wide adjustable range. | Can be help as a selfie stick, or converted to a standing tripod stand. Perfect to travel, very Light and compact. 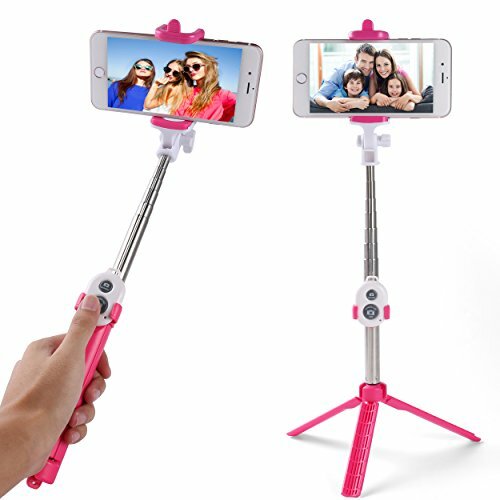 | Selfie Stick can expand from 7.5 to 27.5 inches Max.